DEFENDER2.NET - View topic - External Auxiliary lighting. More questions! Home > In Car Electronics > External Auxiliary lighting. More questions! External Auxiliary lighting. More questions! I've recently bought some LED lights for my DCPU and have a few questions. I have searched around and read so much information about it, but these are the questions I have left. There's loads of info on the front foglight button and how its a earth switching so is a little more difficult to wire up, but from what I can see of the diagram I can't work out how that's actually the case. Have I got this wrong or is it just my incorrect terminology. To me it looks like when the button is pushed and you have 12v from the full beam indication light the relay is activated. Anyway, if that's all correct and I'm just getting myself confused, where is that relay because I already have that switch plugged into something. Is this standard wiring or is this something the PO had wired in? If the PO had something wired in then I'll probably just cut and solder those wires to some extra relays but if its standard I would like to use the original relay. I can't see anything in the wiring diagrams and I know there used to be a winch installed. If it helps, I do not get any red indication light but I do get the green illumination. On another note, I have a few wires I'm not sure about that were coiled up behind the steering column. Any ideas what these could be? Ok, just as I post this I have a brainwave. It's the Blue and White/Blue that are the switching pair. This seems to suddenly make sense as I get illumination but no indication. I'd now guess that there isn't a standard relay hidden somewhere. Just a little surprised they've put the switch there if nothing was fitted. Still, any ideas about the loose coiled wires under the steering column? The wiring to the spot light switch looks home-made to me. Scrub that, cleaned my specs and the colours match the diagram. The relay should be in the battery box (pic 72 onwards). Your other wiring matches the factory colours for the front speaker wiring. I would have agreed with you. In fact I do about the factory colours, except the switching blue pair don't go anywhere. They're just looped behind the switch. Sorry if my photo doesn't show that clearly. It just seems weird to have the switch and illumination but to feed nothing, especially is its a factory install, which I believe it is. I'm guessing that I can use them as the feed to my relays though. Now how I want it to work, is for the front fog light switch to activate the ability for the front light bar to come on with the full beams AND for the rear spots to come on with the reverse light. It would be great if I could combine both of these lights into the one switch but my mind is boggling a little as to how I can get this to work without getting overly complicated or resorting to coding an Arduino. Ok, so I have a few days off and expect to be able to spend the day working on this tomorrow. For clarity from the last posts, I am looking to have the Aux2 switch on the dash to activate all the extra lights. When the Aux2 button is pressed, I want the rear spots to come on with the reverse light and the front light bar to be on with the full beams. Obviously I want all this to go off when that Aux2 button isn't activated. In addition I've added a rear switch so I can just switch the rear spots on if I'm working behind the truck. This is what I've come up with so far but I am not sure if I'm just making this more complicated that needed. I used to be good at this stuff, but for some reason my mind has struggled when planning this out. Should the rear lamp override switch be independent of the Aux2 switch or not? At the moment you have to have the Aux2 pressed for the rear lamp to work at all, either with reverse or the manual override. I'm fairly easy with that. Either or! I'm happy for the Aux2 Switch to activate and deactivate everything. I think you are using an extra relay to how I would do it (and you need to convert the Aux2 switch to positive side switching). Now the extra relay comment was where my mind was boggling. I also think I'm using an extra relay but I couldn't figure out how I could wire it to get the same ability using one less. I also don't quite understand what you mean by positive switching. Isn't the Aux2 doing positive switching as it is? I mean, it is switching the 12v positive from the battery. From the top diagram in this thread you can see the Aux2 switch output (pin 1 - blue/black) is a switched ground going off to the relay coil. The other end of the relay coil is +12V from the main bean warning lamp feed. If you link the grounds from the coils of the two individual circuit relays, you can insert the Aux2 switch there and omit the first relay altogether. I suspect this is what Martin was referring to. 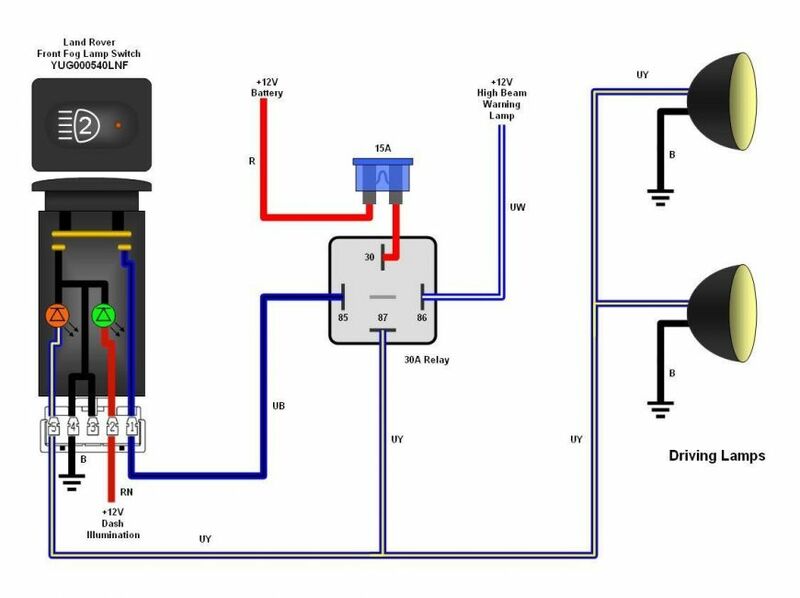 You could, though, introduce a second relay in the rear work light circuit so that they only come on if the side lights are on, as shown in the diagram below (ignore the switch and sockets on the right of the diagram). The practical effect of this is that the lights only come on in the dark when they're needed. That arrangement also gives the opportunity to change the manual switch for an on-off-on type (auto-off-manual) and use it to switch the second relay. This removes the need to run two separate feeds to the lights. Ah perfect! That's the sort of info I'm after! Final draft? Think this will keep me busy for today. Ok, just a follow up and a mention of one of my original concerns. I've obviously now moved the AUX2 switch to the GND sides of both circuits, but would this not mean that, for example, my full beams now turn on the rear reverse light? I know I could add a few diodes if needed, but not sure if that's something I need to worry about.